The management of modern power systems is becoming more and more complex and poses several challenges to the involved actors (i.e. grid operators, aggregators, retailers). The increasing penetration from weather-dependent renewable sources (mainly wind and solar) requires development of flexibilities. Renewable power plants are required to provide ancillary services in a similar way as conventional plants. Demand becomes more and more active, while storage devices are progressively integrated. As the complexity increases, information plays a major role in managing the whole system. In several applications, where operational decisions are required by the different actors at time scales varying from a few minutes up to a few days ahead, it is necessary to anticipate the behavior of quantities like renewable generation, electricity demand, electricity prices, heat demand, dynamic line rating (DLR) and others. Short-term forecasting models have been developed intensively in the past for this purpose. 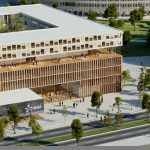 This talk aims to present an overview of the state of the art and to discuss the opportunities for improving performances in the new context of energy digitalization where large amounts of information become available. Artificial intelligence based forecasting techniques are promising for handling such information. However, several questions are raised and will be addressed in this talk. Is, for example, the well-known principle of parsimony in forecasting challenged by the large amount of data that are now available? Are the forecasting techniques of today more adapted to handle overfitting issues that might result to low generalization of the models on new data. What the “classical” forecasters have still to say to modern data scientists? What are the margins for improving accuracy? How the benefits from predictive analytics can be quantified? In this talk we try to illustrate the properties, in the context of high dimensional settings, of machine learning methods. These methods even using sometimes quite elementary indices of statistical correlations between phenomena can give surprisingly interesting results on large data sets. In particular, they can be compared to more traditional approaches using physical analyses of the problem at hand. To illustrate this, we will present 3 examples related to energy and production. In the first example, we provide a machine learning approach for the intraday load curve forecast concerning electrical consumption in France using sparse regression functionals and aggregation of expertise. In a second example, we investigate the results of different statistical learning methods for modeling the wind power. In a third example, we investigate statistical methods to produce a segmentation of the French territory into stable and homegeneous regions from a climatological point of view. This last example is not directly issued from energy consumption or production but is very linked to this problem, since finding homogeneous climate domains will be an important factor of stability for the analyses of many phenomena linked to renewable energy. For utilities, a good knowledge of the future electricity consumption stands as a central point for the reliability of the network, investment strategies, energy trading, optimizing the production etc. The advent of innovating technologies such as smart grids, electric cars and renewable energy production give rise to new challenges and opportunities challenges in the field of forecasting. 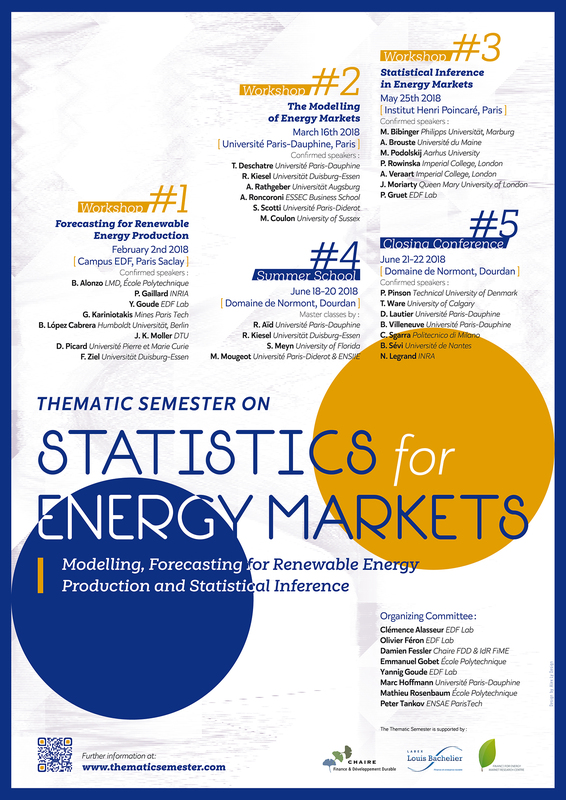 We will dress a panorama on recent developments made at EDF R&D on probabilistic forecasts on energy markets. The increasing exposure to renewable energy has amplified the need for risk management in electricity markets. Electricity price risk poses a major challenge to market participants. We propose an approach to model and forecast electricity prices taking into account information on renewable energy production. While most literature focuses on point forecasting, our methodology forecasts the whole distribution of electricity prices and incorporates spike risk, which is of great value for risk management. It is based on functional principal component analysis and time-adaptive nonparametric density estimation techniques. The methodology is applied to electricity market data from Germany. We find that renewable infeed effects both, the location and the shape of spot price densities. A comparison with benchmark methods and an application to risk management are provided. We build and evaluate a probabilistic model designed for forecasting the distribution of the daily mean wind speed at the seasonal timescale in France. On such long-term timescales, the variability of the surface wind speed is strongly influenced by the atmosphere large-scale situation. Our aim is to predict the daily mean wind speed distribution at a specific location using the information on the atmosphere large-scale situation, summarized by an index. To this end, we estimate, over 20 years of daily data, the conditional probability density function of the wind speed given the index. We next use the ECMWF seasonal forecast ensemble to predict the atmosphere large-scale situation and the index at the seasonal timescale. We show that the model is sharper than the climatology at the monthly horizon, even if it displays a strong loss of precision after 15 days. Using a statistical postprocessing method to recalibrate the ensemble forecast leads to further improvement of our probabilistic forecast, which then remains sharper than the climatology at the seasonal horizon. The increased penetration of renewable energy imply increased variability in the power generation and hence an need for good and reliable forecasts. A good forecast imply both a reliable point forecast and a reliable and precise forecast of the uncertainty or preferably the full predictive distribution. The mapping from wind speed to wind power imply complicated distributions of wind power, even if the distribution of the wind speed forecast if simple. In this talk we focus on uncertainty evaluation based on Stochastic Differential Equation (SDE) formulations of the forecasting problem. These SDE-models are driven by point forecast of wind speed or wind power, in both cases this imply that the modelling focus on the uncertainty evaluation, including covariance structures (autocorrelation). The forecasts are evaluated by known scoring rules in a cross validation set up. It appears undeniable that energy collected from renewable resources constitutes a substantial part in the overall supply of electricity in many contemporary energy markets. The German EPEX SPOT SE is not an exception in this case. One of the major features of this exchange is that it establishes prices for a MWh of electricity multiple times a day. It is primarily done on day-ahead auctions and during intra-day trading. The latter tends to be conducted on the grounds of a more precise renewable energy supply data. The day-ahead auctions are, in turn, based on the respective forecasts. Needless to say, those forecasts tend to be erroneous. In this paper we demonstrate that the influence of forecasting errors on day-ahead prices is non-linear. That is, a wrongly calibrated forecast may exert different impact on electricity prices depending on a sector of a merit-order curve. To show this explicitly, we model intra-day prices given errors in the forecasts for wind and solar energy generation. In doing so, we exploit an empirical supply and demand curves approach as well as a non-linear optimization technique. We show that forecasting accuracy increases as long as we take non-linear effects into account. Short-term electricity forecasting has been studied for years at EDF and different forecasting models were developed from various fields of statistics or machine learning (functional data analysis, time series, semi-parametric regression, boosting, bagging). We are interested in the forecasting of France's daily electricity load consumption based on these different approaches. In this talk, I will present how combining forecasts can lead to a significant improved accuracy on the data sets at hand; the improvements lie in a reduced mean squared error but also in a more robust behavior with respect to large occasional errors.